There are currently over 260 million dairy cows worldwide, each producing 115 kg CO2 equivalent per day, or about 2.7% of global greenhouse gas emissions1,2,3. In South America, Africa and Asia, deforestation to make way for pastureland is an urgent concern. About 83% of the deforestation in the Amazon rainforest is used for pasture4. The Real Vegan Cheese Project intends to reduce dependence on large-scale commercial dairy in the production of cheese and casein-derived products by replacing the dairy cow with baker’s yeast, Saccharomyces cerevisiae. We are engineering the synthesis of bovine and human Alpha-S1, Alpha-S2, Beta and Kappa casein proteins as well as a kinase enzyme that may help the process of making a solid cheese. It is our hope that we can synthetically produce cheese that is more ethical, healthier and produces lower emissions than traditional dairy. By replacing dairy cows with carbon-sequestering bioreactors, we could save thousands of doe-eyed Holsteins and Jerseys from the misfortunes of the industrial farm, reduce the incentive for deforestation and drastically lower the GHG emissions of casein and cheese production. We estimate that we could reduce emissions per gram of casein by 40-90%. Furthermore, Real Vegan Cheese is committed to open source and open patent biology. It is our hope that this process can be employed and improved upon by enterprising biologists, hackers and epicures the world over. On paper, making Real Vegan Cheese should be simple. First, genetically engineer brewer’s yeast to produce cheese protein. Then, grow the yeast in a bioreactor and purify the protein. Combine the cheese proteins with a vegan milkfat replacement, a (nonlactose) sugar to feed the ripening bacteria, and water to produce a sort of vegan milk. From there, proceed with the age-old traditional cheesemaking process for the desired type of cheese. In practice, it gets a bit more complicated. Milk, it turns out, is a fairly complex substance. It is nature’s solution for packing large quantities of protein, calcium, and fat into liquid form that can turn into a solid for prolonged nutrient release in a suckling mammal’s stomach—a pretty impressive bit of biochemistry. It’s not surprising that vegan cheese is hard to make. The cheesemaking process relies on specific protein interactions that simply do not occur with proteins from any nonmammalian source. The obvious solution is to invent a nonmammalian source of the required proteins. With regard to glycosylation, its influence on micelle formation remains an open question. But even a glancing review of dairy science literature will show that correct phosphorylation is likely to make or break the project5,8. Interestingly, though protein phosphorylation was originally discovered in casein and discovered way back in 18839, the kinase enzyme responsible for this phosphorylation wasn’t identified until 201210. In mammals, this unusual kinase—no, not "casein kinase," but one named Fam20C—is actually secreted along with the cheese proteins, and our team is designing for a similar effect in yeast. By altering the kinase secretion sequence, optimizing the kinase sequence for yeast, and co-expressing it with cheese protein, we’re aiming for casein proteins correctly phosphorylated upon secretion. The molecular part of our project breaks down into four discrete milestones. Full details about materials, methods, specific experiments and our results can be found in our iGEM wiki notebook. The milk proteins important for cheese are the four caseins: kappa, beta, alpha-s1, and alpha-s2 [ref]. For full details about these and our chosen casein variants, see see this summary. We start with published sequences for both the cow proteins and proteins from human milk, as bovine caseins are common human allergens. For the protein kinase, we use sequence from human Fam20C. No animals needed! To complicate things, the small size and limited secondary and tertiary structure in our target proteins may make them more prone to unwanted degradation by proteases in the yeast secretory pathway13 However, even if we use protease deficient yeast strains, the presence of the Kex2 protease is required to cleave the alpha-factor signal peptide from each of our proteins of interest and must remain in our expression system. Kex2 protease amino acid recognition sites (Lysine/Arginine and Arginine/Arginine)14 occur in the native sequence of three of our study proteins: bovine alpha casein S2, human kappa casein and FAM20C. For these, we will create two constructs: one which translates into the native amino acid sequence and one in which all Kex2 recognition sequences are disrupted to express biochemically similar amino acids (Lysine/Lysine). In the case that we obtain whole proteins from both constructs, we will continue with that containing native amino acid sequence. Finally, we add flanking regions that include recognition sequences for the SapI restriction enzyme, needed for the downstream cloning process, and BioBrick enzyme recognition sites. We also disrupt internal recognition sites for these restriction enzymes with synonymous DNA sequence mutations. Fig. 1. Map for representative part insert, human kappa-casein (Kex +) with design modifications. Construct details on Parts page. Milestone 2: Clone, transform plasmids to E. coli, & sequence confirm. We clone the composite DNA constructs into the pD1214 plasmid backbone using a kit that simultaneously digests at the external SapI sites and ligates. 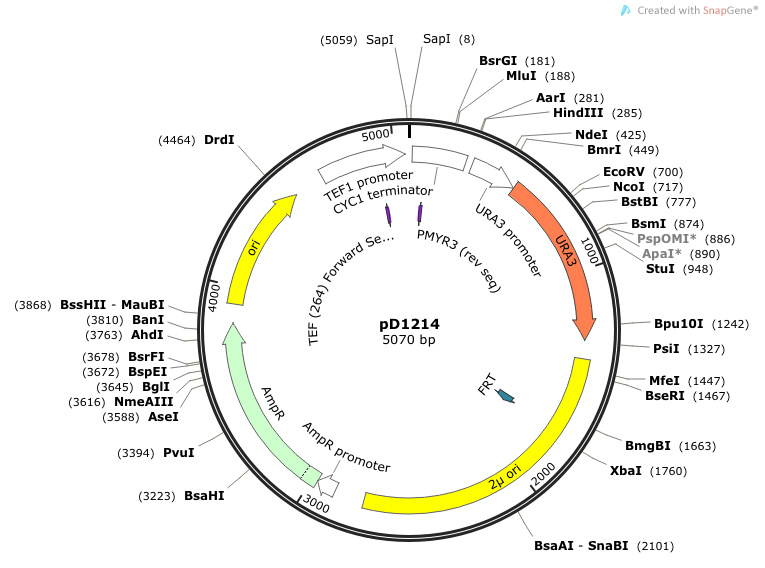 This plasmid can be selected in E. coli using its Ampicillin-resistance gene. It also contains a strong constitutive TEF promoter for gene expression in yeast and a URA3 marker for in Ura deficient yeast strains. Fig. 2. Map of pD1214 shuttle vector before adding inserts, above. The plasmids DNA are then transformed into E. coli for selection, the plasmid DNA is extracted, and submitted for DNA sequence confirmation. Milestone 3: Transform plasmids to yeast. We are working with this strain of baker’s yeast: Saccharomyces cerevisiae, UV-Sensitive Strain, G948-1C/U, alpha, rad1 rad18 phr1 ura3 mutant in excision repair. It is Ura deficient, allowing for selection of our desired plasmid transformants on URA negative media. Why are we using S. cerevisiae yeast for casein protein expression? A model system for trans-specific protein expression. Baker’s yeast is familiar as a human consumable. If protein cleavage in the secretory pathway is a problem, we will need to obtain a protease deficient yeast strain that still contains Kex2. So far this is all standard genetic engineering, and while getting the yeast to express and secrete enough protein may prove challenging, this part of the project should not present any extraordinary problems—in fact, we’ve already discovered published papers demonstrating that most of the casein proteins can be expressed in yeast or E. coli .12, 18, 19, 20 We will verify protein expression in yeast culture supernatants via SDS PAGE gel electrophoresis, then explore protein purification methods. Milestone 1): Part design Done! Milestone 2): Clone, transform plasmids to E. coli, & sequence confirm. 10 done; have not yet gotten a successful transformation of human kappa casein (Kex -) into E. coli.. Milestone 3): Transform plasmids to yeast. Not complete. Currently optimizing our yeast expression system. Milestone 4): Verify protein expression and secretion in yeast and purify proteins from yeast growth medium. Not yet attempted. But we’re not stopping here! Head over to the Real Vegan Cheese wiki to keep following our progress. We have gone through numerous hurdles; we have put our utmost effort into keeping this project open source and non-profit. We represent something different - something revolutionary. Powered by citizen science and representing a community spirit, we are attempting to do something that will provide vegans, lactose intolerant people, and people with cow’s milk allergies around the world with an alternative- real vegan cheese. We are attempting to make a real vegan cheese by engineering normal baker's yeast (S. cerevisiae) to express milk proteins (caseins), purifying the proteins, creating a milk-substitute by blending in vegan replacements for lactose and milk fat, and finally turning the resulting milk-substitute into semi-hard cheese like gouda using the regular cheese-making process. In doing so we are not only creating something that will revolutionize the food industry, but we are also representing the groundbreaking concept of citizen science and community labs. We are giving people of all sorts of ages and experience the opportunity to learn and take part in something revolutionary. McMahon DJ & BS Oommen (2013) Casein Micelle Structure, Functions, and Interactions. Ch. 6 in Advanced Dairy Chemistry, Springer Science+Business Media, pp 185-209. Dejmek P & Walstra P. (2004) The Syneresis of Rennet-coagulated Curd in Cheese: Chemistry. Physics and MicrobiologyVol 1, Ed 3. Elsevier Academic Press. Sood SM et al. (2005). The Protein Journal, 24 (4): 227-232. Tagliabracci VS et al. (2013). Secreted protein kinases. Trends Biochem Sci. 38(3): 121-130. Tagliabracci VS et al. (2012). Secreted kinase phosphorylates extracellular proteins that regulate biomineralization. Science 336(6085):1150-1153. Bitter GA et al. (1984). Secretion of foreign proteins from Saccharomyces cerevisiae directed by α-factor gene fusions. Proc Natl Acad Sci USA 81: 5330-5334. Kim Y-J et al. (2005). Production of human caseinomacropeptide in recombinant Saccharomyces cerevisiae and Pichia pastoris. J Ind Microbiol Biotechnol 32: 402-408. Thomas E Creighton TE (1993). Degradation. Ch. 10 in Proteins: Structures and Molecular Properties , 2nd ed. W H Freeman and Company. pp. 463–473. Julius D et al. (1984). Isolation of the putative structural gene for the lysine-arginine-cleaving endopeptidase required for processing of yeast prepro-alpha-factor. Cell 37(3): 1075-1089. Strausberg RL& Strausberg SL (2001). Overview of protein expression in Saccharomyces cerevisiae. Curr Protoc Protein Sci . Chapter 5:Unit5.6. Jimenez-Flores R et al. (1990) Expression of Bovine β-Casein in in Saccharomyces cerevisiae and Characterization of the Protein Produced in Vivo. J Agric Food Chem 38:1134-1141. Goda SK et al. (2000) Recombinant expression analysis of natural and synthetic bovine alpha-casein in Escherichia coli. Appl Microbiol Biotechnol 54: 671-676. Byung-Kwon Choi B-K & Jimenez-Flores R (2001) Expression and Purification of Glycosylated Bovine β-Casein (L70S/P71S) in Pichia pastoris. J Agric Food Chem 49: 1761-1766.